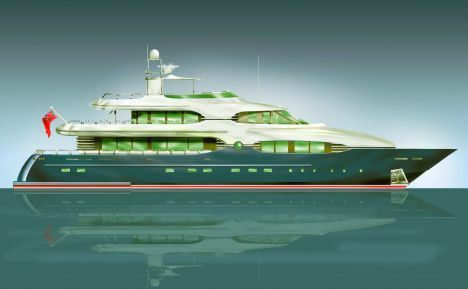 The growing market interest for ships varying between 35 and 45 metres in length, has convinced Pendennis Shipyards of Falmouth, England, to produce a motoryacht of 38 metres designed in collaboration with Laurent Giles, superyachts, tall ships and other prestige vessel designers since 1927. The Pendennis 38 is built for long oceanic crossings; for this reason, thanks to the two Caterpillar engines and hull type, it can sail for 5,520 nautical miles at an average speed of 10 knots totalling 23 days of non stop navigation. As far as the interiors are concerned these offer maximum cruising comfort in line with the potential of the vessel. The interiors are very spacious thanks to a beam of some 8.4 metres, leaving every option for personalized layouts which, since the motoryacht is entirely designed and built by Pendennis Shipyards at their premises in Cornwall, can easily be carried out in accordance to customer needs. Given the size of the ship, it is in any case possible to make 10/12 guests highly comfortable as well as the crew. One of the main pecularities of the standard equipment is the presence of a Jacuzzi on the sun-deck accompanied by a useful bathroom area normally only found on the main deck or, if lucky, on the upper deck.